Expert Skiers, Intermediates, Beginners, Snowboarders and Apres-Ski! Austria's most famous resort, a lively town with chic overtones which most skiers agree has Austria's best intermediate/expert skiing in the mountains above it. When will it snow in Kitzbühel? The next notable snow forecast for Kitzbühel is 5cm2in, expected on 26 April, with around 15cm6in forecast over the next 7 days. The Austrian Ski Resort of Kitzbühel has direct access to 158km98 miles of downhill skiing, with 70 marked pistes, served by a total of 30 ski lifts. Kitzbühel is one of the best known names in skiing history and remains one of winter sports key destination resorts to this day. Residents of around 40 countries annually make the trip to the Tyrol to visit the resort marketed as 'The Pearl of the Alps'. Located beneath the famous Hahnenkamm mountain, it has retained its compact village centre and traditional architecture which has grown from a thousand years of history. Today the village is a mix of the liveliest and most colourful international winter sports and après ski of a modern resort, with underlying sophistication in shopping, restaurants and accommodation. In short, there is the proverbial something for everyone here. One of the earliest Austrian resorts to embrace downhill skiing, the first downhill skis arrived in the village in 1892 after a resident Franz Reisch, who later became mayor, read a book from Norway about the sport. Two years later a large consignment of skis arrived from Norway to be used in the first Ski championships at the resort. At that time downhill skiing was of the basic Telemark technique, Alpine skiing developed in the early twentieth century in Austria, and the first of the famous Hahnenkamm races was staged in 1931. The longest possible descent in Kitzbühel is 7km4 miles long and the most difficult run is the 'Skiroute Streif Rennstrecke', which is 2km1 miles in length. Kitzbühel is a name synonymous with serious skiing, and conjures up images of historic victories in the great Hahnenkamm race by skiing legends like Franz Klammer. The 'Streif' run on the Hahnemkamm is actually 3200 metres long and racers hit speeds of around 140kph (88mph), around 50,000 spectators arrive each season to watch this spectacular event. There are, however, plenty of other less internationally well known runs around Kitzbühel's mountains, better suited to we mere mortals. There are around 160km (100 miles) of largely lift inter-linked ski runs in the ski area include over 60 lifts giving a combined 75,000+ sph uplift between the neighbouring resorts of Aschau, Aurach, Jochberg, Kitzbühel, Kirchberg, Pass Thurn and Mittersill. These includde a popular 35km (22 mile) one-day 'Ski Safari' route, with trails marked by an elephant symbol and a special guide available from the tourist office. For winter 2004-5 the Safari route was fully completed thanks to the installation of the 3S gondola, described as the world' most beautiful and spectacular, with the lift rising 400m above the valley floor in places. Since winter 2007-8 the entire route has also been covered by snowmaking. The local ski area was extended still further by the Ki-West gondola which, more or less, links it to the SkiWelt ski area nearby, creating a ski region of more than 400km (250 miles) of piste, one of the world' largest, although with a few short bus trips needed in places to make connections, if that matters. Straying further afield the giant Kitzbüheler Alpen AllStarCard takes in the skiing above more than 30 villages in the area and opens up a giant region of nearly 1100km of trails, served by over 360 lifts. Skiers and 'borders have a larger choice than usual of ski schools with five in operation, the largest of which is the internationally famous Rote Teufel School or 'Red Devils' with over 200 instructors offering tuition in all disciplines. Current snow conditions are broadcast through live film of the mountain peaks on the local cable TV service every morning. There are a variety of pistes to suit all levels of skier ability, from Beginner to Expert. The Kitzbühel Horn mountain boasts two half pipes, a quarter pipe and a sprint slalom course. A table jump allows jumps from five to ten metres The Ski Safari route is also popular with boarders who enjoy the powder options. Every ski shop in the resort offers 'board hire and every ski school offers snowboarding tuition. A second snow park is complete with boxes, kickers and rails. Open (since October 13, 2018). Closes : May 1, 2019. Usual opening is early December, and usual closing is Mid April. NOTE:- Lift and Piste openings are always subject to Snow Conditions in Kitzbühel. Kitzbühel is able to make snow, on 84km52 miles of ski runs, with 780 snow cannons. The 30 ski lifts of Kitzbühel are able to uplift 76,230 skiers and snowboarders every hour. Kitzbühel is in the Austrian Alps in Tyrol, Austria. The nearest airports to Kitzbühel are Innsbruck Airport, Salzburg and Munich. There are six airports within three hours drive. The Webcams in Kitzbühel are not always up-to-date. Please check the date on the image to ensure you are seeing current snow conditions. Kitzbühel is known for its lively and often sophisticated nightlife centred on the many restaurants, 40 or so bars and four discothèques. Especially popular bars include the Londoner on Franz Reisch Strasse, the Goldene Gams on Vorderstadt and Flannigans on Jochbergerstrasse. Warming drinks on offer include 'Jagertee' (tea with rum or schnaps) and Glühwein. The Casino is open daily from 7pm with live music in the lobby from 9pm. There is also a cinema and other popular evening activities include bowling, tobogganing and sleigh rides. The ice rink is open 13.30 - 16.00 everyday, as well as from 20.00 - 22.00 on Fridays and 10.00 - 12.30 on Sundays. Want to Know when it Snows in Kitzbühel? Create your own J2Ski Account to get Free Snow Reports and Forecast, with Powder Alerts. 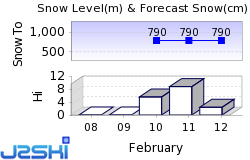 Click above to get Snow Reports by e-Mail for Kitzbühel. By doing so, you agree to Our Rules. Other popular Ski Areas near Kitzbühel. 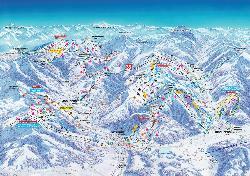 Popular Ski Areas in Austria. Ski Hire Shops in Kitzbühel. Where can you Ski or Snowboard? For current snow conditions, see our Kitzbühel Snow Report. Want to ask about skiing and snowboarding in Kitzbühel? Try our Austria Ski Forum. Or contact Kitzbühel Tourist Office. Note :- The information on J2Ski concerning Kitzbühel, where not clearly factual, is opinion only and is neither definitive or exhaustive. Warning :- Snow Sports are Dangerous! Skiing, snowboarding and all winter sports involve risk of serious injury or death. You MUST confirm all information, especially snow and weather conditions, in Kitzbühel before you ski or board. You participate at your own risk.